A grand smattering of stuff! To all of those who feel I should have a cooking blog, allow me to change your mind in less than, oh, let’s say, forty seven seconds. I am a huge number one fan with a foam finger of Ziploc’s new microwave steam bags. Frozen salmon, meet Ziploc. 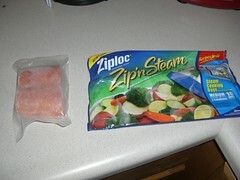 Ziploc, meet frozen salmon. 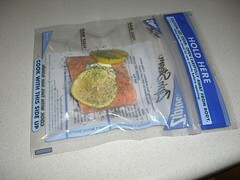 Frozen salmon, Ziploc, meet lemon, dill and butter. And meet them in the microwave for five (YES FIVE!) minutes. 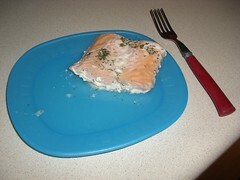 Perfectly cooked and seasond (albeit nasty looking) salmon. Meet the perfect side dish. Are you sure you still want a cooking blog out of me? Metalia is knocked up, so is everyone else in the world but METALIA? You’re dead to me. Anybody else want to break the news to me now so I don’t find out through pictures of YOUR PREGNANT BELLY IN FLICKR? Would someone please pay me prolific amounts of money for contributing this to the gene pool? And last on the list tonight is a picture that I had done while in Disneyland in June. 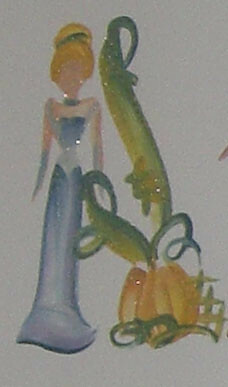 It is the moosh’s real name hand painted in Disney Princesses. This is impressive for two reasons. Number one being that it is impressive. 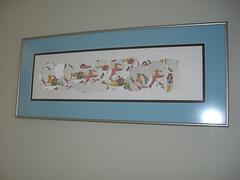 Number two is that I FRAMED IT ALL BY MYSELF. Put it together and EVERYTHING. LET’S SEE YOU DO THAT METALIA! Anyway. Since I’m not going to share the moosh’s real name here on the world wide web I’ll first show you the wicked awesome frame job that is so much more awesome than any ultrasound picture of Metalia’s. 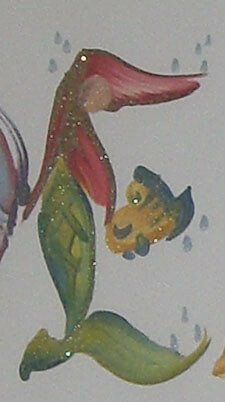 And then I’ll show you a few letters from the painting. 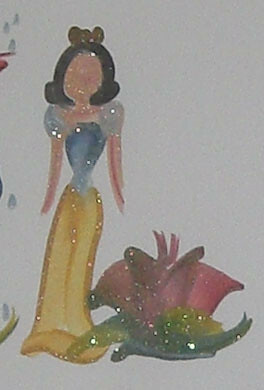 This is Snow White as an L.
This is Cinderella as an A. And this is Ariel as an E.
I’m off to eat more Cheetos. And sleep on my stomach, because PREGNANT PEOPLE CAN’T SLEEP ON THEIR STOMACH. wow that’s a pimp painting. and your lunch makes me wish I liked salmon! Reese’s last blog post..South Carolina, I Think. That would be my kinda cookin’ blog! How in the world do you so awesomely tame that child’s hair?? What products do you use? How do you style it ’cause let me tell you she is one gorgeous kid with some equally gorgeous hair! First, I’m going to go and get the zip & steam bags. Second, the moosh has the best clothes of anyone EVER. Your daughter has some serious cuteness! 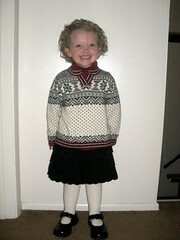 I also have naturally curly hair and my mother was not nearly as gifted as you are in styling it. I’m with you on the pregnancy thing… the next person that asks me when I’m going to “take the plunge” is going to be hurt. 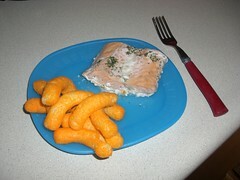 umm salmon and cheetos? you sure you’re not knocked up?!!? i too love those steam bags. they rock my world. oh, and we need to get jake and moosh into modeling. then they can take care of us when we’re old! Biddy’s last blog post..help a sistah out! Those bags look awesome! I have never seen them before. Of course, I live in Oklahoma so we should be able to buy those bags in the local grocery store in 2012. The moosh is one adorable child. Way to contribute to my ovaries doing flip flops. Barb and I are NOT pregnant. If we ever do become so, you will be one of the LAST people we tell – just kidding. Barb thinks everyone (and their sister, cousin, and dog) is pregnant, too, right now. It’s starting to get creepy. The Moosh’s name is Cinderella, isn’t it?! Isn’t it?! I KNEW it! She really IS a princess! No fair! #2 you sure you aren’t pregnant… cheetos and fish? #3 You NEED to start a cooking blog I would subscribe! #4 … um …. I need some sleep. Good nite! 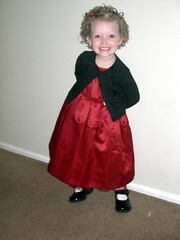 She has been and for at least the forseeable future will be the Cutest little girl I’ve ever seen. And thanks for the tip on the bags, I’m actually thinking of using some salmon for this tomorrow. And like 4 days after my hysterectomy, I’m 25, my friend told me she was pregnant. Yeah. Fun. I swear every person I know is getting pregnant. Even the infertile ones. I don’t get it. hmmm that salmon looks vile! The cheetos on the other hand look scrumdillyicious!! And the moosh. is just too cute for words. So make it a baking blog!!! If you use parchment paper to make a packet, you could do that same salmon thing with thin-sliced potatoes and some spinach leaves and it would only take about 20 mins baking time. And you wouldn’t get the nasty carcinogens that cooking in plastic infuses into your food. I am not pregnant. I just thought I’d share that with your right off the top. Also, I love the moosh thread pics. She really is adorable. ADORABLE. Worth millions. Moosh is just too cute! And I want that curly hair for my very own self. You should get some SERIOUS money for those genes! Maybe you should put together something along the lines of Semi-Homemade with Sandra Lee from the Food Network – sometimes those fast easy tips are what moms in a rush are looking for! Salmon and cheetos? Call Food Network. We have our next star!! I ALSO HAVE NO GIRL. Loralee’s last blog post..Dude. Cops must totally LOVE pulling ME over. I’m all over those ziploc bags girl! Piper of Love’s last blog post..Meme’s Spring Annoying? And those cool steam bags! Cheetos. The perfect side dish to everything. You are my kind of chef… and I love the picture, too! I’m impressed! I gotta learn to do that. Also, that’s my kind of cooking blog. I might just have to go buy some salmon. I will have you know that I miss sleeping on my stomach very much. And I know I’m dead to you right now, but perhaps you can find it in your heart to forgive me when I post the video of me TOTALLY MAKING A TOTAL FOOL OF MYSELF at my friend’s karaoke birthday party last night. Karaoke should not be performed by me without benefit of at least 3 tequila shots. Lesson learned. Having been pregnant far too many times, I can say with certainty that those are not Cheetos, they are Cheese Poofs. I love the moosh’s sign. I have one for my first son in a Korean art pattern of some sort. It is awesome, but my daughter would die for the princesses. Not sure if it’s worth the trip to Disneyland though. Cheese Puffs go with EVERYTHING!!! You stick it to those Pregos, sleep on your stomach! Moosh is SOOO cute (and well dressed). wait. you mean her real name isn’t moosh? Cheese puffs go with EVERYTHING my dear … EVERYTHING. Don’t ever let anyone tell you any different…. I made your Cinnamon Rolls last night and they were a BIG hit!! Everyone loved them and the recipe actually made almost 3 dozen and 5 small monkey loaves. My husband could have died and gone to heaven! Thanks for the great recipe and keep em’ coming!! I love your blog!